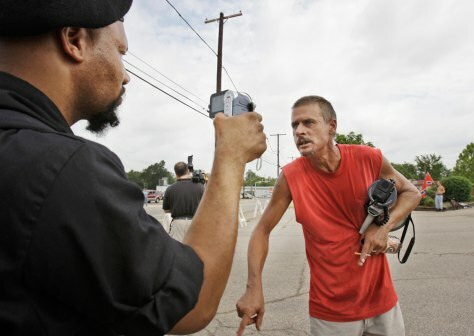 An unidentified black activist, left, films a protester with a bullhorn during a demonstration in Paris, Texas, on Tuesday. The face-off between black and white protesters began with a march through downtown by about 100 blacks. They were protesting the state's handling of the case of a black man who was run over and dragged by a vehicle.